As part of our student series, we talk to Reiki student and Therapy Directory Membership Services executive Hannah Ervin about her journey so far. Hi Hannah! Firstly, can you tell us what drew you to Reiki initially? Did you have experience with complementary therapies before? I’m not exactly sure when I became aware of Reiki. It just seemed to keep coming across my radar. I especially warmed to the Reiki principles and the idea of being connected to the world around. Once you decided you wanted to learn how to practice Reiki, where did you look for training courses and how did you pick the one you’re on? While investigating, I came across several online courses. 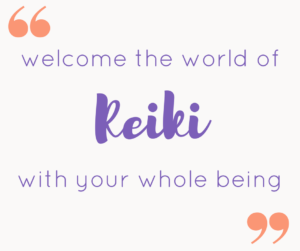 I signed up to one but quickly realised that, although interesting, there was an essential element missing (later I found out that person-to-person training is an integral part of Reiki). However, as my interest grew I found myself talking about it more. My sister mentioned a friend who practices and teaches, so I jumped at the chance to meet her. When I met Michelle I instantly knew that this was for me and that she was the Reiki master to take me through this journey. Can you explain what is involved in Reiki training and what you are qualified to do at each stage? There are three levels. I am working towards completing level one. It started with a full day of one-to-one tuition. I learnt about the history and theory, the Chakras (where they are and what they represent), the importance of grounding and meditation, energy sweeping and aura cleansing. I received my first attunement (a ceremony performed by the Reiki master connecting you with Reiki energy). I then had the opportunity to practice the hand positions on Michelle. I went away with homework to complete – keeping a diary, performing daily grounding, self-treatments, meditating and also practising on as many people as possible including three specific case studies. I’ve had one follow-up session and more to come, which is great for additional feedback and advice, plus Michelle is available anytime I have questions. I’m expecting it to take about three months for me to complete level one and be ready for level two. Level one allows you to practice Reiki on yourself, family and friends. It is a time for practice and learning. Level two establishes and adds to your skills. At this stage, you can start offering treatments to others and charging. Level three is the Master Practitioner level, meaning you have the highest skill set available and can also teach others. Are you hoping to make a business of Reiki? Reiki is a fabulous addition to my life. In the future I see Reiki supplementing but not replacing my day job (I’m lucky enough to love what I do). I’m looking forward to level two and can see myself in a few years progressing to level three. I’m open to any other opportunities it may bring my way. 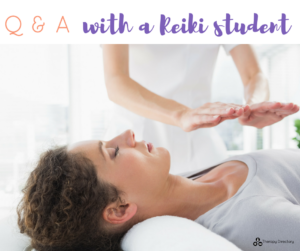 What advice would you give to someone thinking about learning Reiki? It is an amazing experience whichever level you want to get to. Talk to as many people as you can about it. You’ll be surprised just how many people have come across it and been affected by it in some way. Make sure you meet the Reiki master before you book onto a course. This is such a personal and unique journey that having a Reiki master who you connect with will only enhance your experience. And lastly, be open – to get the most out if it, welcome the world of Reiki with your whole being.